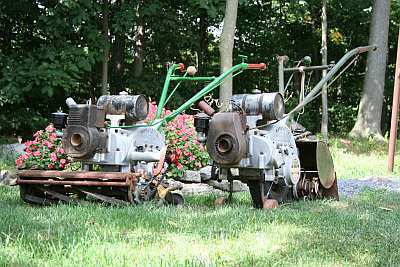 Here are my two 1947 Roto-Ette Home Gardeners manufactured by ROTOTILLER, INC., one with a 25" reel type mower attachment made by the Locke Company. ROTOTILLER, INC. tried this concept before without much success in 1938 with the introduction of the Wheelbarrow Cultivator. 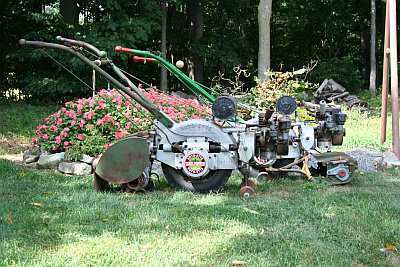 In 1944 ROTOTILLER, INC. made plans to discontinue the professional type B model and devote their efforts to the homeowner with a garden. This machine has 228 parts of which 36 are bearings. It had a list price of $330 when it was introduced and was produced from 1945 until early 1949. The Locke Company started in 1895 as the Locke Steel Chain Co. Work on lawn mowers started in the early 1920's. 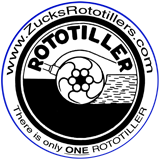 It appears that ROTOTILLER bought the reel mower from Locke and then fabricated the framework to attach it to the Home Gardener. Locke reels were known for their fine cutting ability. Sadly it appears they have gone the way of other great companies of years gone by as they are now listed as an Ariens' brand. I bought the tiller on the left in December 2000 mostly disassembled, but in good shape. The B&S engine has a severely worn crankshaft and is not in running condition. The one on the right was purchased in running condition November 30, 2001 looking pretty much like it does here. There were numerous attachments made for these tillers. They included a cart, lawn roller, seeder, air compressor, and snow plow. There are photos of these in my photo album. The first Home Gardener came off the production line in 1945, but by early 1949 orders had dried up. The cheaper front tine tiller was just too much competition for the Home Gardener. George Done, ROTOTILLER'S chief engineer, was ready to save ROTOTILLER, INC. by a tiller he designed and built in his home basement.